Look at the stoat of it! Sometimes you need that extra oomph, be it in a bass sound, a kick drum or anything else. If your sample or virtual instrument hasn't got the guts in the low frequencies, you have a few options. You could transpose the notes to a lower register, but that may not be possible in your arrangement; you could layer in a sample that does have the weight, but this could destroy the character of your original sound; or you could stick a sine wave underneath and program it to follow the sound at the right time, pitch and level, but this can take a while to get right. Audiowiesel decided to make it all easier. Loaded into Kontakt 5, Sub will reinforce your lowest sound with additional low frequency tones that play at the same time. Basically, you can dial in virtual subharmonics to play at the same time as your audio.There's no pitch detection for audio, as this being a Kontakt instrument (full version required), you can only feed it MIDI signals. To quickly and dirtily beef your sound up, feed the same MIDI information to Sub. 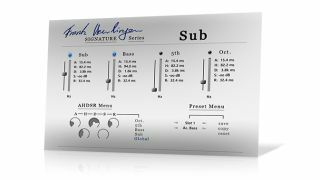 Next, you can dial in the Sub oscillator to act as - well done - a sub, and the Bass oscillator to reinforce your original sound's fundamental tone (ie, it plays a sine wave at the same frequency as the MIDI note it receives). You can stick a fifth and an octave in there, too, though really, your instrument won't contain any partials at sub's 5th setting, or at the 5/1 harmonic where the lowest Sub oscillator would imply there being one - but this isn't a science lesson, this is a bass enhancer! Envelope controls are dialled in per-oscillator or globally via the AHDSR. Sub can be had for six whole euros (eight whole dollars) at the Audiowiesel website.